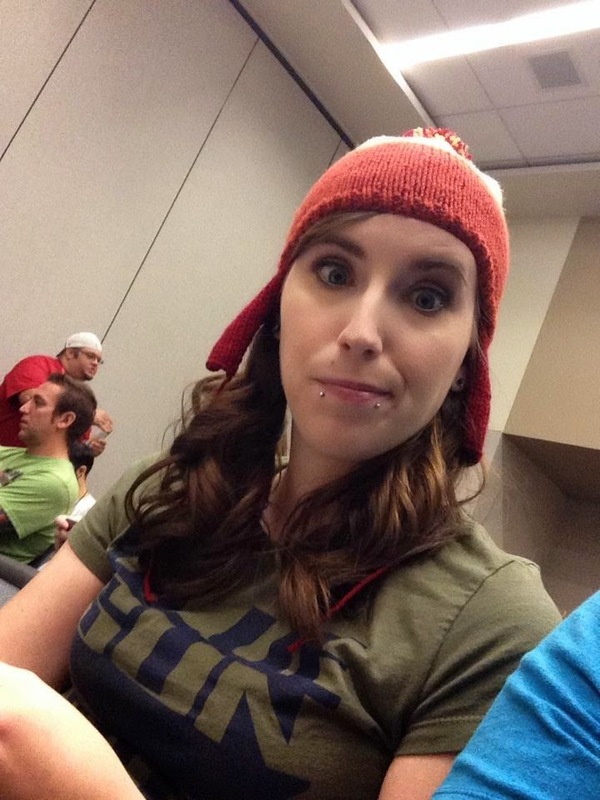 The Marvelous Misadventures of Madam Geek: Misadventures of Phoenix Comicon! 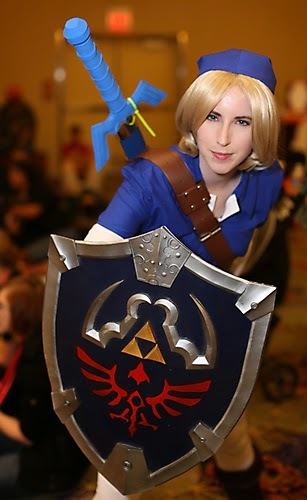 As opposed to last year when a piece of the triforce fell off my shield, everything remained intact and attributed to a fantastic time at Phoenix Comicon! 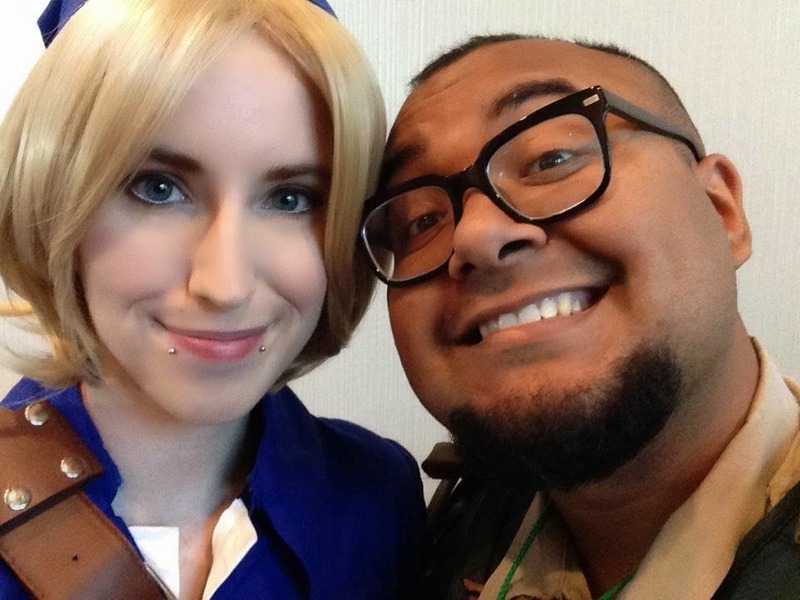 This convention brought numerous firsts to my cosplay experience. The blonde mop for my Link costume proved to be not quite as daunting as I previously anticipated for my first wig. I was photographed in costume and put into a few website galleries this year, which is a new step for me. Last but definitely not least, I fabricated my own costume this year. Let’s start at the beginning, I became determined to work on my own costume entirely this year. Last year my wonderful Mother ‘helped’ make my green tunic. By helped I mean, became a sorceress with a sewing machine to create it out of fabric and no pattern. But hey, I made the hat! This year, I found a pattern, adjusted it accordingly, and began leveling my sewing skill. With a few pointers here and there from the master, I had successfully crafted my first tunic! Next, countless hours spent on search engines and tutorials ensued to figure out the best way to make Iron Boots and bracers (and eventually the hilt of a the master sword). 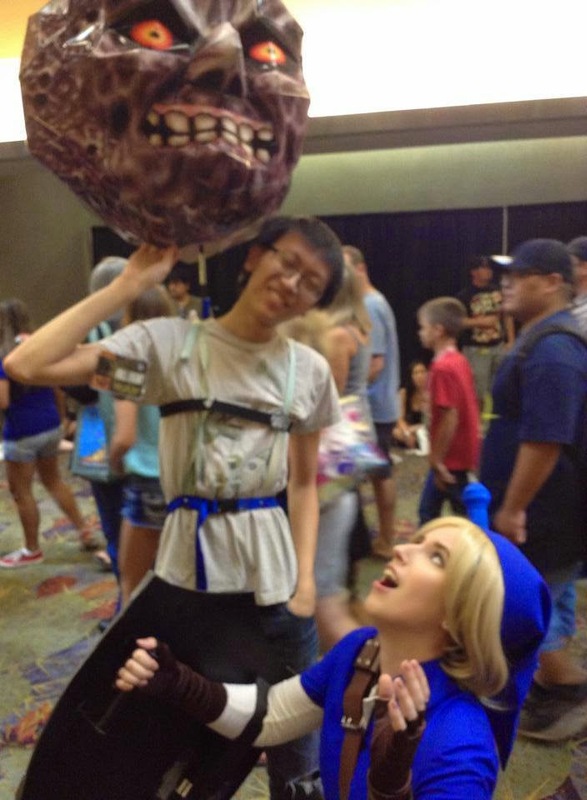 Being the hero of time did not help as much as I had imagined it would. What seemed like endless hours passed in the Arizona heat working with foam, plasti-dip, and dark magic.. I mean spray paint. The experience provided me with a feeling of accomplishment and gratification unlike any other. My Link costume turned out as I had envisioned, and even better when assembled entirely. This lead to another satisfying occurrence, unimaginable appreciation. 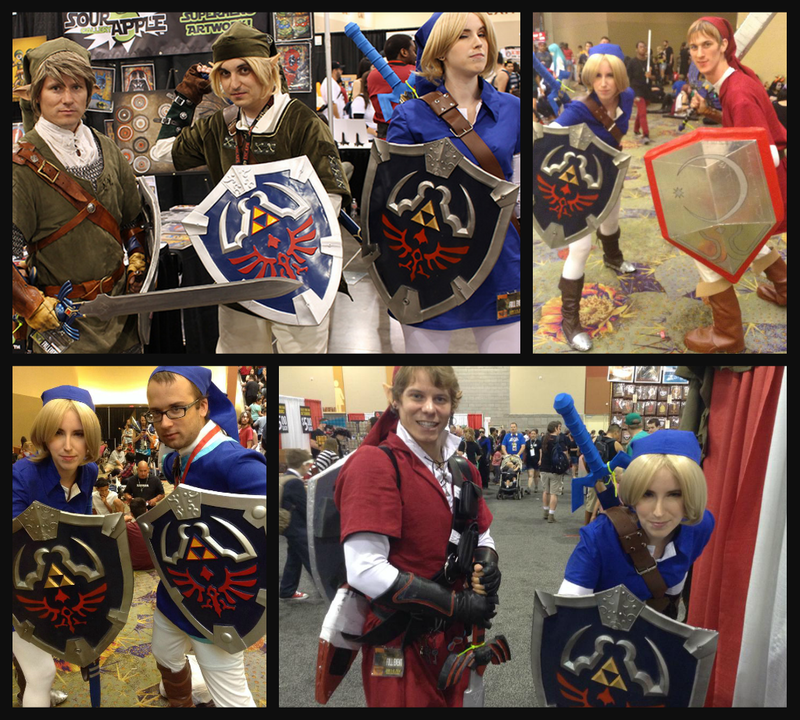 While walking the floor of the convention I observed various other Link’s and got the pleasure of chatting with quite a few of them. 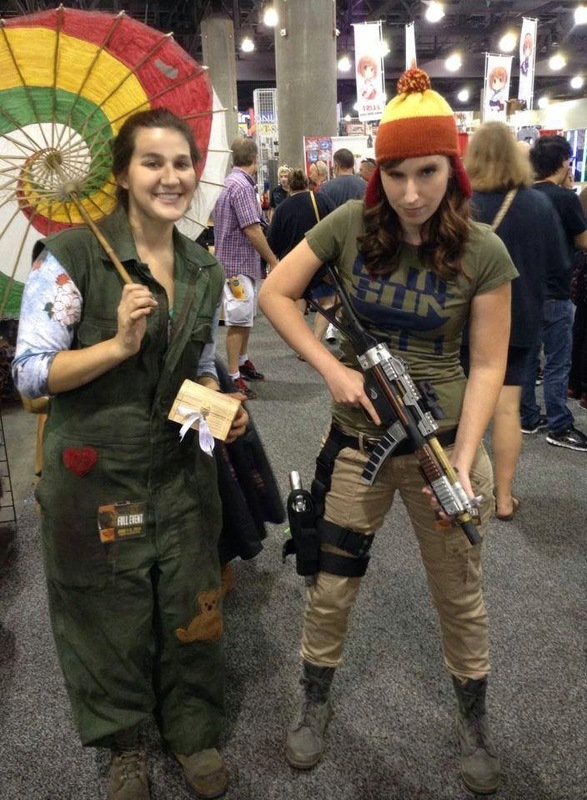 Geeking out with like-minded people is one of my favorite parts of going to a convention. Exchanging information on materials, and complimenting props. Next year my costume will be even better thanks to the imaginative ideas I gathered. In addition to conversing with fellow Heroes of Hyrule, several people wanted to take a picture of/with me which left me ecstatic and proud of the job I had done. One highlight of creating and portraying a beloved character is the recognition from others. My heart melts faster than ice cream dropped on hot pavement when a small child wants to take a picture by my side. To witness smiles creep across the faces of fellow nerds as they pass by fills me with pure bliss. On Friday evening, I had the satisfaction of attending Geek Prom. Geek Prom was an event much like any other dance, only catered to geeks! Nearly everyone attended in costume, and busted out their best dance moves. Surrounded by peers, I showed off my best sprinkler, cabbage patch and running man. Practically everyone jumped to their feet to partake in the Time Warp. Not a shred of judgment was shown, no prom drama, only good times. Geek Prom proved to be one of the most uplifting moments of my weekend. How could I skim over one of the best parts? The panels! One that I attended which wasn’t part of my original schedule was Manu Bennett who proved to be an absolute blast to witness. His charm and wit paired with humorous stories from his acting career made for an extraordinary time. A few highlights included: the time that he practiced a scene from Arrow in which he accidentally choked a guy out, and inviting fans up on stage while teaching them a haka (a traditional ancestral war cry, dance or challenge from the Māori people of New Zealand). Meanwhile there’s one mandatory panel that I view every year, John Barrowman. That enthusiastic, delightful man always brings a grin to my face and an unfiltered cackle from my core. 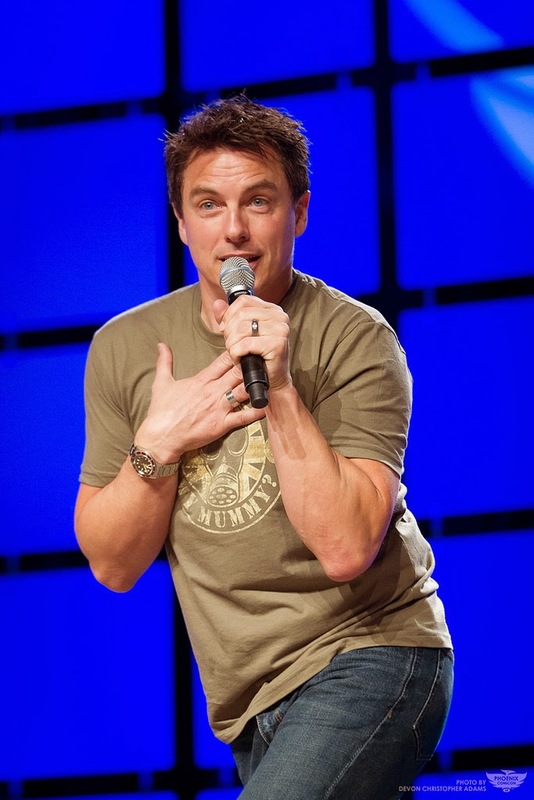 From tales of his marriage to behind the scenes moments on a variety of shows, Barrowman remains an utter riot. Lastly, an essential subject to note on: my significant other. As enjoyable as Comicon always turns out, it would not have been as stellar if not for him. My bracers needed lacing, my boots needed fixing, and I needed a level head which at times it was hard to maintain. Being fast-paced and crowded, Comicon can be a lot to handle. Honestly, being quite shy, I’d have never braved Geek Prom alone. My player two helped me unwind after every day of attendance. Sharing the experiences of Comcion and geeking out with someone close who will alert you to a temporary flaw in your cosplay to which you can do the same is like the cherry on top of the sundae of Comicon. In summation, Phoenix Comicon brings new, thrilling adventures each year. 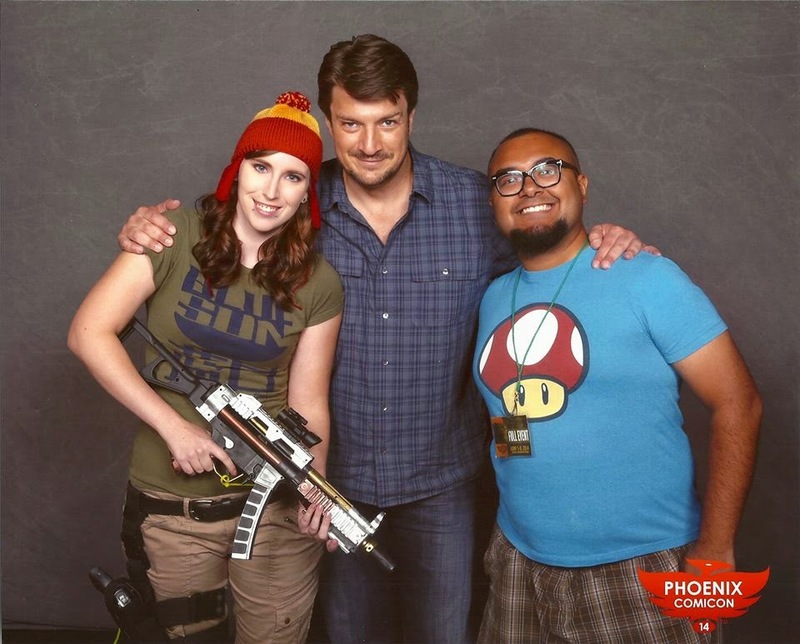 Despite not making it into Nathan Fillion’s panel after a lengthy wait in line, the convention turned out spectacularly. Left with a feeling of geek satisfaction and overall exuberance, the event came to a close. Back to the days of being Alicia/Madam Geek and no longer Link or Jayne until next year.